1. Allow the fruit to defrost slightly at room temperature for about 1 hour. 2. 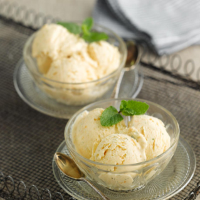 Place in a food processor with the yogurt, honey and mint leaves, and whizz until smooth. 3. Scrape into a rigid container or 6 ramekins and freeze for an hour or more, until firm. If freezing overnight, place in the fridge for an hour before serving to soften. This delicious dessert is really simple to make but if you’re short on time, try our LOVE life you count… raspberry & blackcurrant frozen yogurt, which contains 75 kcals per serving and goes perfectly with a handful of fresh berries.